Nutritional Components of Flax. 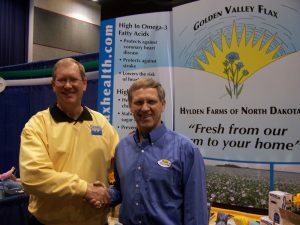 Golden Valley Flax. Flaxseed has been used in the diets of humans for thousands of years. The Babylonians cultivated flaxseed as early as 3,000 B.C., and millennia later, in 650 B.C., Hippocrates used flaxseed for the relief of intestinal discomfort. Flaxseed was so important for the health of his subjects that the 8th century king, Charlemagne, passed laws and regulations governing its consumption. Today, consumers are turning to flaxseed for its many health benefits and pleasant, nutty flavour — a distinctive addition to baked products. Flaxseed provides essential nutrients, including protein, essential fatty acids, and vitamins and minerals; and it contains both soluble and insoluble dietary fiber. Moreover, flaxseed is a rich source of lignans, a type of phytoestrogen. Phytoestrogens are compounds that may protect against certain types of cancer by interfering with the effects of estrogen. Additional information about the nutritional components of flaxseed is given in the following sections. 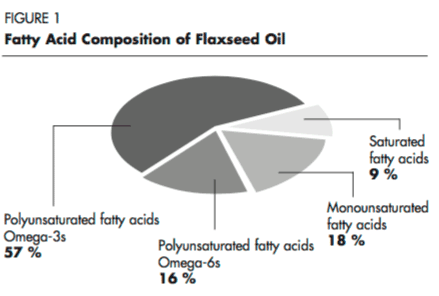 The major nutritional components of flaxseed are oil and protein, as shown in Table 1. A 100 g portion of flaxseed provides 1,890 kJ or 450 kcal. Analysed by the American Oil Chemists’ Society’s (AOCS) Official Method Am 2-93, which is based on the Federation of Oils, Seeds and Fats AssociationsLtd. (FOSFA) Official Method. The American Organization of Analytical Chemists(AOAC) Method 996.06 will produce a lower fat content. Flaxseed is naturally low in saturated fat and provides a moderate amount of mono-unsaturated fat (see Figure 1). Roughly 73% of the fatty acids in flaxseed are poly-unsaturated. 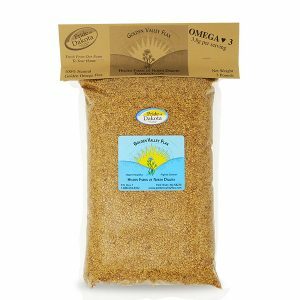 Flaxseed is particularly rich in alpha-linolenic acid (ALA), an omega-3 fatty acid; it contains a lesser amount of linoleic acid (LA), an omega-6 fatty acid. Because of its high ALA content, flaxseed has an omega-6/omega-3 fatty acid ratio of 0.3: 1 The growing concern that the linoleic acid content of the typical Western diet is too high has led some experts to recommend replacing dietary omega-6 fatty acids with those from the omega-3 family. 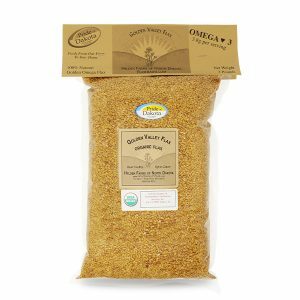 Consuming flaxseed or foods rich in ALA, such as omega-3 enriched eggs derived from hens fed flaxseed, increases the omega-3 fatty acid content of the diet and improves the dietary omega-6/omega-3 fatty acid ratio. Flaxseed is a very rich plant source of alpha-linolenic acid, an essential fatty acid (EFA) of the omega-3 family. 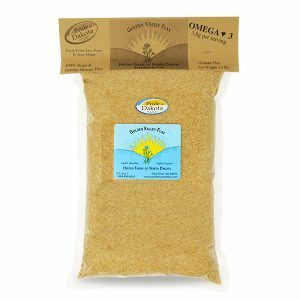 Omega-3 fatty acids have been shown to regulate gene transcription and expression, thus altering enzyme synthesis, and to modify several risk factors for coronary heart disease, including reducing serum triglycerides and blood pressure. 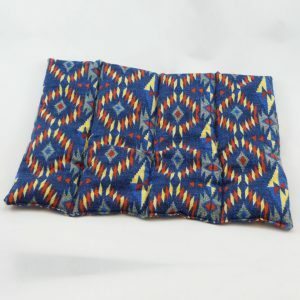 They also protect against thrombosis and certain types of cancer and modify immune and inflammatory reactions. [6-8] EFAs are required for maintaining the structure of cell membranes and the permeability of the skin, as precursors for eicosanoids such as prostaglandins and thromboxanes, and in cholesterol transport and metabolism. There are two EFAs in the human diet: Alpha-linolenic acid (18: 3n-3)[*], the parent fatty acid of the omega-3 family, and linoleic acid (18: 2n-6), the parent fatty acid of the omega-6 family. Lignans are phytoestrogens — compounds found in plants that have weak estrogen activity in animals. [Other common phytoestrogens include isoflavonoids such as daidzein and genistein found in soybeans, some other beans, seeds and whole grain products. The richest source of lignans is flaxseed, which contains high levels of the lignan precursor secoisolariciresinol diglycoside (SDG). Lignans are also widely distributed in the plant kingdom, being present in small amounts in most unrefined grains such as barley, buckwheat, millet, and oats; legumes such as soybeans; and some vegetables. Lignans are not present in appreciable amounts in flaxseed oil. The flaxseed lignan prescursor SDG is converted by gut bacteria to the main lignans found in humans and other mammals — enterodiol and enterolactone. (Enterodiol and enterolactone are called animal or mammalian lignans to distinguish them from SDG and other plant lignan precursors.) The concentration of enterodiol and enterolactone in urine is related to the concentration of plant lignans in the diet — large intakes of plant lignans result in large amounts of enterodiol and enterolactone excreted in the urine of rats and humans. Populations with high fibre diets and high intakes of phytoestrogens such as lignans, tend to have lower rates of hormone-dependent cancers such as breast cancer than Western populations with low fibre intakes. Lignans are believed to protect against hormone-sensitive cancers by inhibiting certain enzymes involved in hormone metabolism, reducing the availability of estrogen and interfering with tumour cell growth. ,  as high-fiber foods appear to offer protection against certain types of cancer. Epidemiologic studies show that people living in Asia, Africa and eastern Europe have lower rates of certain cancers, particularly hormone-dependent cancers such as cancer of the breast, endometrium and prostate, than people living in Western countries. Their lower cancer rate may be due in part to their high-fiber diet, which helps lower blood levels of lipids and some hormones. The low-fiber, high-fat diet typical of Western populations tends to raise blood estrogen levels, which may contribute to cancer development by stimulating tumor cell growth. Protein constitutes about 20 g/100 g dry weight of flaxseed. The amino acid profile of flaxseed protein resembles that of soybean flour. Flaxseed contains essential vitamins and minerals. It is particularly rich in potassium, providing about seven times as much as a banana on a dry-weight basis. Flaxseed provides minor amounts of magnesium, iron, copper and zinc. We Are Flax Bread. Winnipeg, MB: Flax Council of Canada. Bhatty RS. In: Flaxseed in Human Nutrition. Cunnane SC and Thompson LU, eds. Champaign, IL: AOCS Press, 1995, pp. 22-42. Nutrition Advisory Panel Meeting: Executive Summary. Winnipeg, MB: Flax Council of Canada, 1995. Clarke SD and Jump DB. Lipids. 1996; 31(Suppl): S7-S11. Schmidt EB, et al. In: Proceedings from the Scientific Conference on Omega-3 Fatty Acids in Nutrition, Vascular Biology, and Medicine. Dallas, TX: American Heart Association, 1994, pp. 208-211. Simopoulos AP. Am J Clin Nutr. 1991; 54: 438-463. Weksler BB. World Rev Nutr Diet. 1994; 76: 47-50. Kremer JM. Lipids. 1996; 31(Suppl): S243-S247. Kelly GE, et al. Proc Soc Exp Biol Med. 1995; 208: 40-43. Adlercreutz H, et al. J Steroid Biochem. 1987; 27: 1135-1144. Rose DP. Annu Rev Publ Health. 1993; 14: 1-17. Adlercreutz H. Scand J Clin Lab Invest. 1990; 50(Suppl 201): 3-23. Vaisey-Genser M. In: Flaxseed: Health, Nutrition and Functionality. Winnipeg, MB: Flax Council of Canada, 1994. Spiller RC. Pharmacol Therap. 1994; 62: 407-427. Cunnane SC, et al. Am J Clin Nutr. 1994; 61: 62-68. Salmerón J, et al. J Am Med Assoc. 1997; 277: 472-477. Health and Welfare Canada. Canada’s Food Guide to Healthy Eating. Ottawa, ON: Minister of Supply and Services Canada, 1992. U.S. Department of Agriculture. Nutrition and Your Health: Dietary Guidelines for Americans. Washington, DC: U.S. Government Printing Office, 1995. Colditz GA, et al. Harvard report on cancer prevention. Cancer Causes Control. 1996; 7(Suppl 1): 1-59. Adlercreutz H. Gastroenterology. 1984; 86: 761-766. Carter JF. Cereal Foods World. 1993; 38: 753-759. *18: 3n-3 is the designation for alpha-linolenic acid, an omega-3 or n-3 fatty acid with 18 carbons and 3 double bonds (denoted 18: 3). 18: 2n-6 is the designation for linoleic acid, an omega-6 or n-6 fatty acid with 18 carbon atoms and 2 double bonds.